Asian markets surged, led by Kospi (+2.4%), Vietnam (+2.3%), HSI (+2.2%) and Nikkei (+2%) on speculation European officials will pledge more financial aid to Greece coupled with positive Japan's industrial and manufacturing activity. Due to the strong overseas markets, FBM KLCI closed 1% or 15.5 points higher to 1558.3, lifted by gains in Tenaga (after the electricity and gas tariffs hike) and banking stocks. The FBM KLCI tested our envisaged weekly 1552-1565 upside targets yesterday before closing at 1558.3 points, following more positive news flows from domestic and overseas markets. of 1577 points by this week, given the bullish technical readings. Immediate support levels are now 1552, 1541 (10-d SMA) and 1537 (38.2% FR). Current rally will be punctuated if index falls below 1525 (uptrend line support). 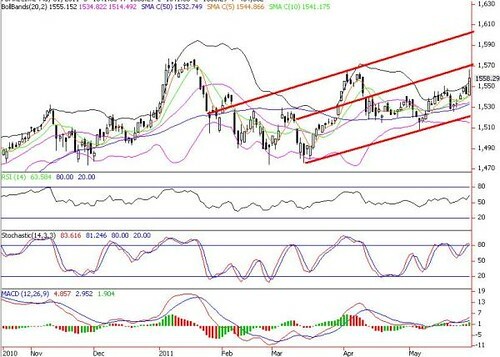 Daily KLCI Is Heading Towards 1570-1600 Resistance.